Remember Peppermeister Roulette 3: Duel to the Death? Before getting down to business with those peppers, Peppermeister and I enjoyed a cocktail while checking out his pepper plants. He grows a wide variety in containers on his patio and deck among the bucolic setting of his backyard. It was all polite exchanges and clever banter outside, but when we took those peppers inside, things got real. Real scary. We spun the wheel of doom, sampled Peppermeister’s fine peppers, wept, laughed nervously, and one of us. . .hiccuped. Nice try, but the votes are in. And the clear winner of Peppermeister Roulette 3 is. . .ME! 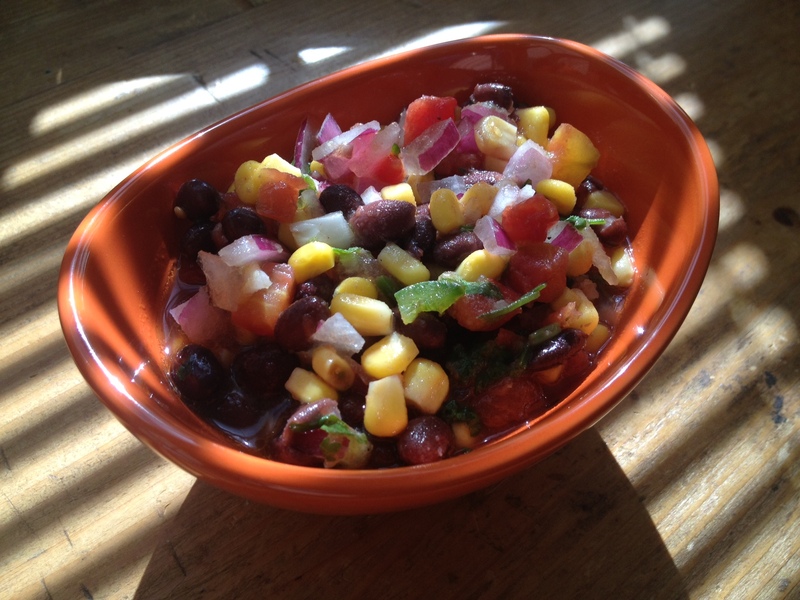 I make this salsa, filled with fresh corn, black beans, and lime, often and in large quantities. Mostly because it’s my most requested dish at family gatherings and parties. You should make it too! Let me know if you get the hiccups. Combine all ingredients in a large bowl. Allow to sit in the refrigerator overnight or for at least 4 hours. The longer this sits, the better it is. This is great over grilled chicken and fish too! Oh this salsa sounds fantastic! I really enjoy reading about your hot pepper experiences, it’s a pity we don’t have as many varieties of peppers in France, I would really enjoy trying out as many as possible. We make something similar and call it Hoosier caviar. Delightful recipe from a delightful woman. Yes, I’m still sucking up. This looks beautiful and sounds fabulous, I have already copied it. I do my own beans, so will have to replace the canned. Otherwise, off to the races. Your own beans will make this even better! It’s a perfect summer salsa and can even be made in the winter with some fresh-frozen summer corn and canned tomatoes. I love it. Don just called this Hoosier Caviar. Must be a thing. The great thing about this recipe is that the pepper/heat is not needed. It’s JUST as good without it – I think the lime juice is the secret ingredient here. Congratulations, winner! This looks like an awesome recipe that my kids won’t touch. I’m all over that. My nieces LOVE this, but they have always liked salads and weird not-kid-friendly foods. My niece used to request “feta” as soon as she learned to talk. Weird kid. I hope you make it – it’s so addictive. I love auto-correct for that very reason. Next video will include a performance by yours truly of “Thug Life,” then I will declare myself the winner. I think I’m the true winner here, because I got to stare at your face for hours whilst editing this video. You don’t have to thank me again; just pass the salsa. I’m thanking you again right now. Thank you. I’ll be right over with the salsa and non-GMO corn chips. As a slight alteration to this recipe: you can use soaked (at least 24 hours) almonds, and chopped peaches or nectarines. I take it corn and black beans aren’t paleo?? I love fruit salsas – I had a watermelon one recently with jalapeno and red onion that was SOOO good (and paleo!). Yep! Corn=Grain and Beans=… Umm… Beans. So they’re both out. Yeah, fruit salsa is definitely the bomb! I honestly didn’t discover the joys of fruit salsa until after I went Paleo; despite that they’re abundantly available. How in the world did I miss them!? And I was just wondering how I was going to prepare some snapper that I have in the fridge! Look at your salsa solving all of the problems in my world. This is perfect for snapper! I’ve made it with mahi mahi before. I swear this salsa could cure so many ills in our world. It brings people together. You are so right, Hippie! And he’s funny, clever and a good sport to boot – he’s the ultimate thug! And I like THIS comment! I encourage all interested parties to refer to the original Video. At 8:35, Rachel clearly says “I don’t think I can do this anymore…..”. Had it not been for the director informing Rachel’s Table (of lies) that the contest was over, she was CLEARLY going to quit. Now, since I happen to be sleeping with the aforementioned director/editor, I have access to the raw footage. Rachel: I don’t think I can do this anymore. 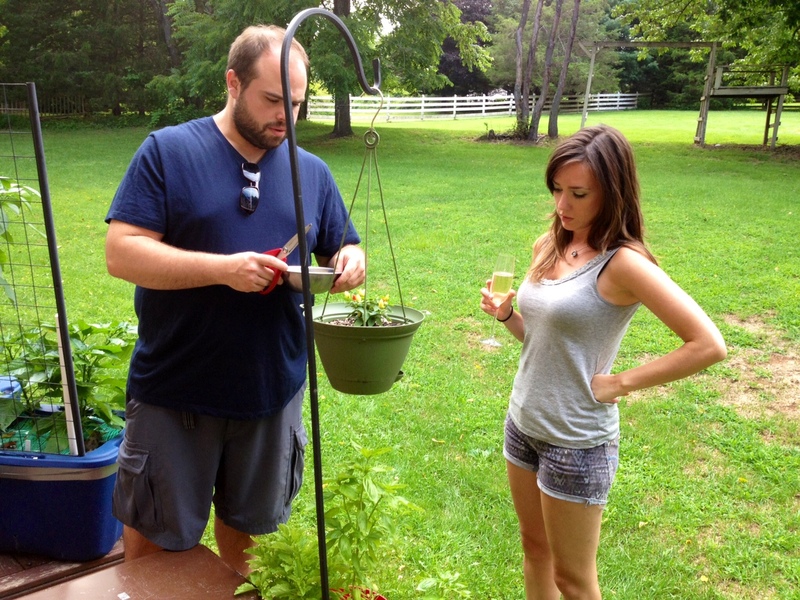 Rachel: He’s just too intimidating with his burly manliness and pure pepper power, I bow down to thee, Peppermeister. You are the true winner. Jules: I’ll edit that out. Rachel: Thanks, I’m hoping to get at least two posts out of this thing. Rachel: I don’t want to do this any more but I will because I’m awesome. Jules: I know you are. You’ve got this. Rachel: Thanks for your never ending support, Jules. Rachel: I am the clear winner. I wanted to let you know that just because I made this salsa (sans tomatoes), added several scorching peppers, and may or may not have declared it the best salsa I’ve ever had, does not (in any way) mean that you won this competition. Check the tape again. I chomped on 6 peppers where as you only nibbled on 5. My hulking hiccups were merely a battle cry towards my inevitable victory. If you’re wondering, that big “L” that just appeared on your forehead does not stand for local. The face that you may or may not have declared this the best salsa you’ve ever had may or may not have made me smile and feel honored. I will neither confirm or deny the pepper eating ratio on the tape. Are you hinting at a rematch? “Burly manliness and pure pepper power” huh? That sounds a little scripted to me. I’m not going to believe it until I see it! I’m still waiting for our chocolate challenge! We can even do chile chocolate if you prefer (currently I’m experimenting with Askinosie’s sea salt flakes, pistachio, and chile dark chocolate). Yummers! I could get the hiccups just looking at that salsa! Congrats, Rachel! As my daughter just informed me today, girls rule and boys drool. Allegedly. Thanks, Angie! The salsa is GOOD – with or without the heat. Thanks, Daile! Anyone that makes this salsa is a winner.